Had a requirement to let SNMP traffic though a firewall this week, I have a client that has both SolarWinds and SCOM, and they need to monitor the external Citrix ADC load balancers. 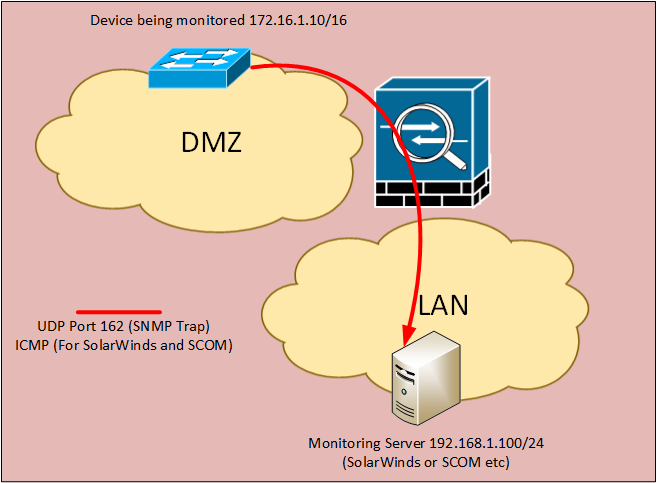 For SNMP we simply need UDP ports 161 and 162 (See below) but SolarWinds maintains ‘ping’ connectivity to the monitored assets, so ICMP also needs to be open. As my ‘weapon of choice’ is a Cisco ASA, here’s how to set it up. 1. Connect to the firewall and proceed to global configuration mode. 2. Assuming my inside interface is called ‘inside’ allow the traffic outbound then apply that ACL to the firewall with an access-group command. 3. Assuming my outside interface is called ‘outside’ allow the traffic inbound then apply that ACL to the firewall with an access-group command. You may want to open UDP 514 (syslog) from the device to the monitoring server, (assuming you have configured syslog on the monitored device). If the monitored device cannot communicate make sure it’s not using DNS to resolve the monitoring server (if so you may need to open UDP 53 to a DNS server).